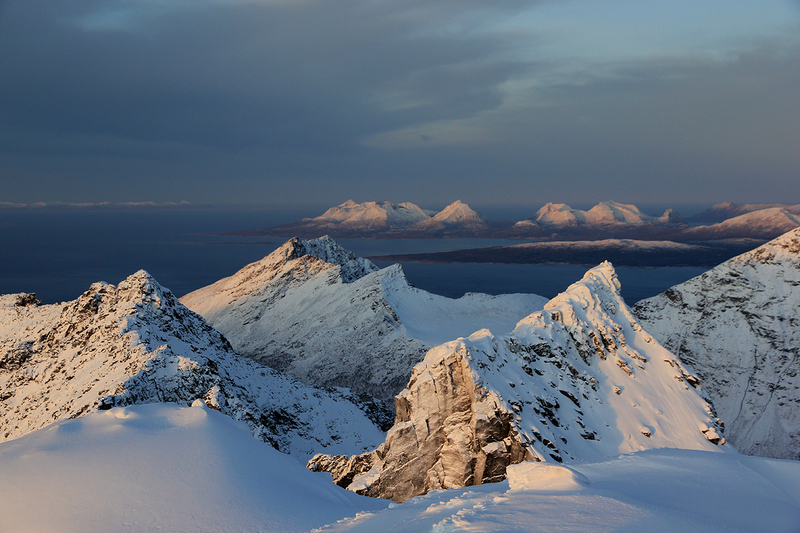 This mountain is located on the island of Andørja in southern Troms. 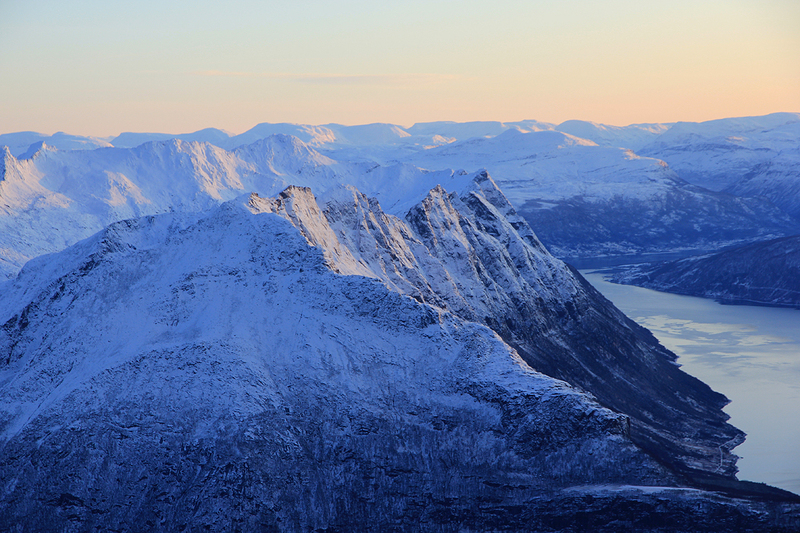 Andørja is one of the most mountainous islands in Norway. 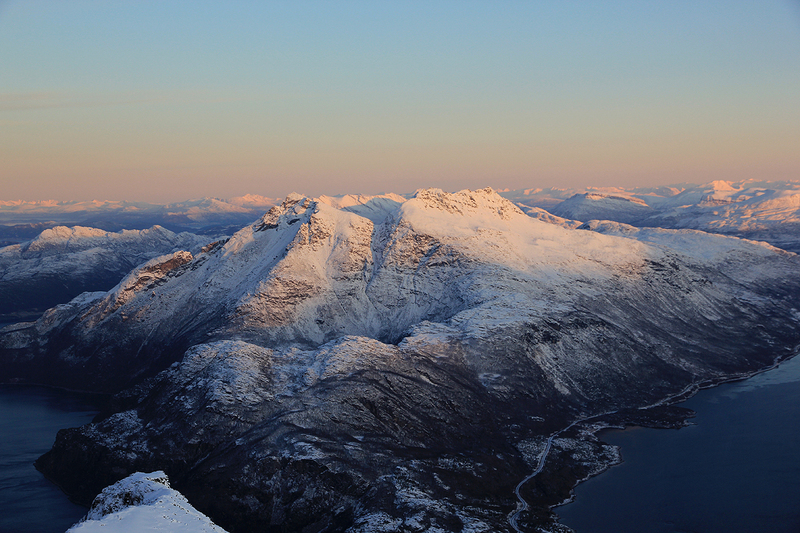 Langlitinden is also the highest island mountain in Scandinavia. 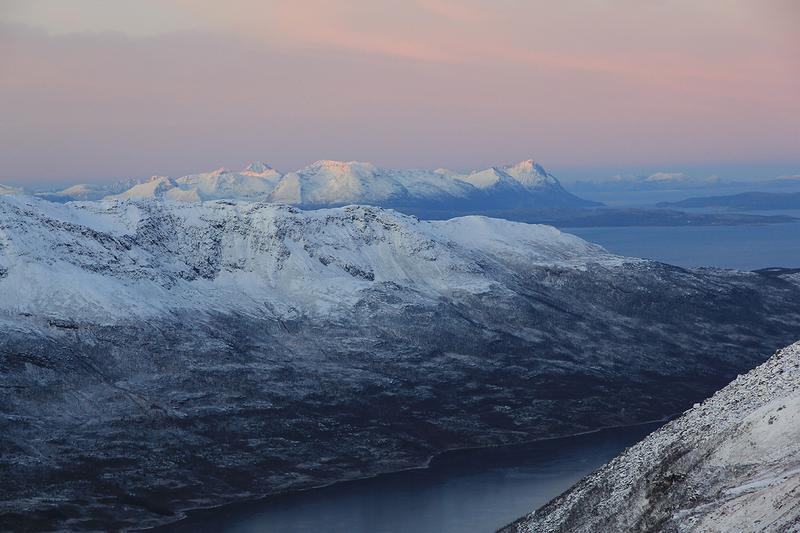 Access is by road from Tromsø, E6 south of Setermoen, then Hwy. 851 to Sjøvegan connecting by bridge to the island. The island is also connected by subsea tunnel to the island of Rolla. Rolla has a ferry connection going south to the city of Harstad. Drive to the small place called Sørvik on the south tip of Andørja. There is a road fork in a downhill curve, this hill leads directly to the subsea tunnel to Rolla. Measure from this intersection. If coming from Sjøvegan, you turn right here. Take the road that forks from the curve and heads north. After 17.2 kilometer, turn right (sharply). Continue to kilometer 20.5, this is just after crossing a bridge. Make a right turn here following a sign saying Skjellelv 8. Stay right at kilometer 23.1 and continue to an area suitable for parking at kilometer 28.3. There may be a small wooden sign at the roadside here saying Langlitinden. Park on your left, this is the trailhead, location N68:51.674, E017:18.305, elevation just a few meter above sealevel. The trail starts directly uphill from the parking area. It first climbs up some of the steep gravel, you should see a sign on top of this. The trail is marked with blue paint. Next, the trail runs into the forest and climbs on the left side of the creek. Higher up, the terrain is more flat and the trail continues gently until it crosses the creek on a nice wooden bridge. A bit further along, there is a second crossing on a similar bridge. From here, the trail turns a bit left and climbs a small ridge pretty parallel to the creek that is now on your left side. The slope eases again as you approach 500 meter of elevation and a small lake, this location is N68:52.042, E017:20.891. Continue a little on the right side of this lake, look for cairns as the route now turns right (south) and descends slightly before traversing and contouring into the narrow entrance that subsequently gains access to the somewhat larger lake at elevation 576 meter. Follow the small ridge that runs across in front of the lake to the left. There are some cairns, but they may be hard to see in winter. 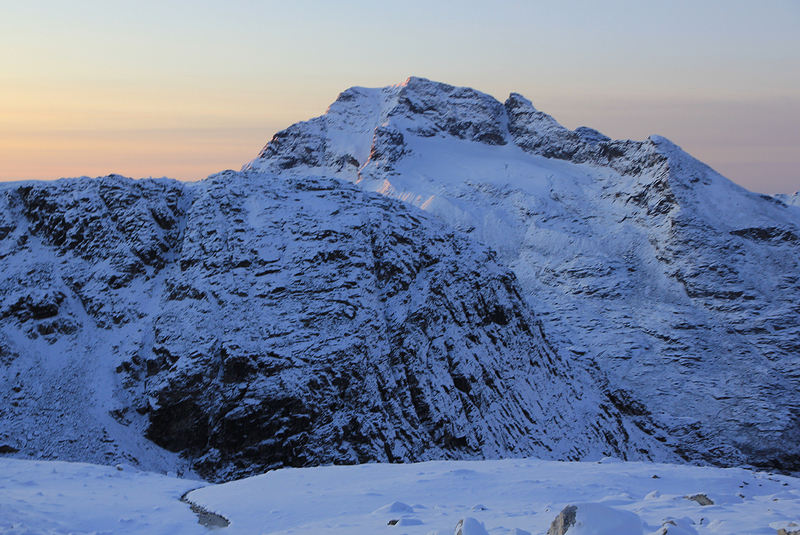 The objective is to gain the lower part of the west ridge that comes down from the Langlitinden summit. This ridge is directly north of the lake. There is a small rock step that may be tricky in winter as water tends to freeze in the area. You should gain the ridge at about 700 meter of elevation, the location N68:51.817, E017:21.478, is pretty good. From here, follow the ridge uphill (east) until a more level area around 840 meter. Turn slightly right and gain the next ridgeline just left (north) of a small hump that is easy to identify. This location is N68:51.840, E017:22.703, elevation about 1000 meter. From here, head directly uphill towards the summit. 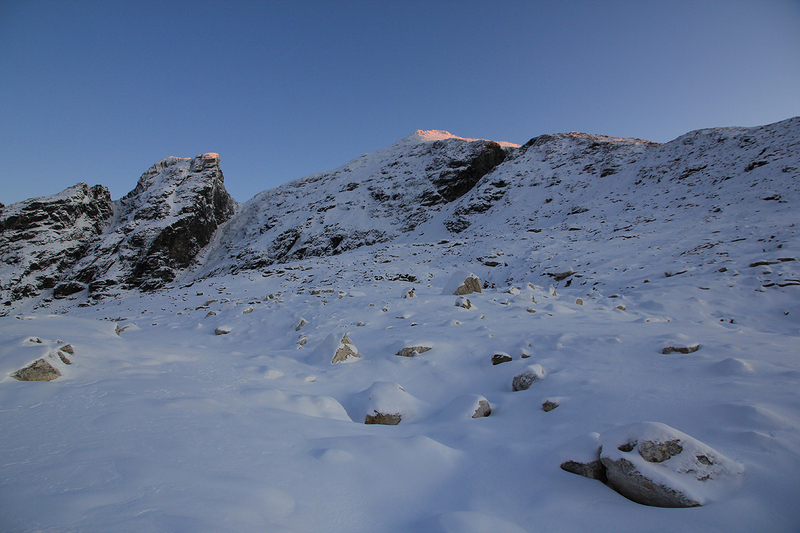 There is another plateau like area at about 1100 meter before the final slope to the summit. Head uphill, perhaps slightly left of the summit, then traverse right while climbing to just below the summit. From here, traverse left and gain a small col just a few meter from the highest point. 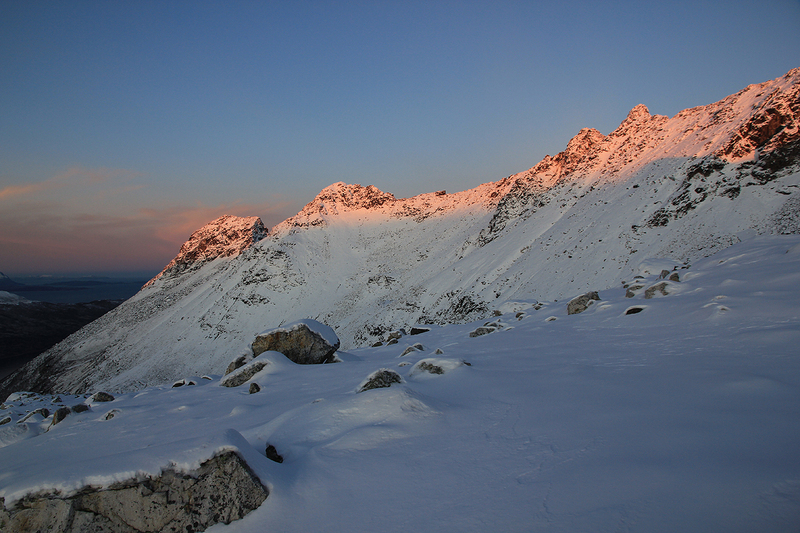 Beware that this mountain is steep on the far side and that there may be dangerous cornices in winter. 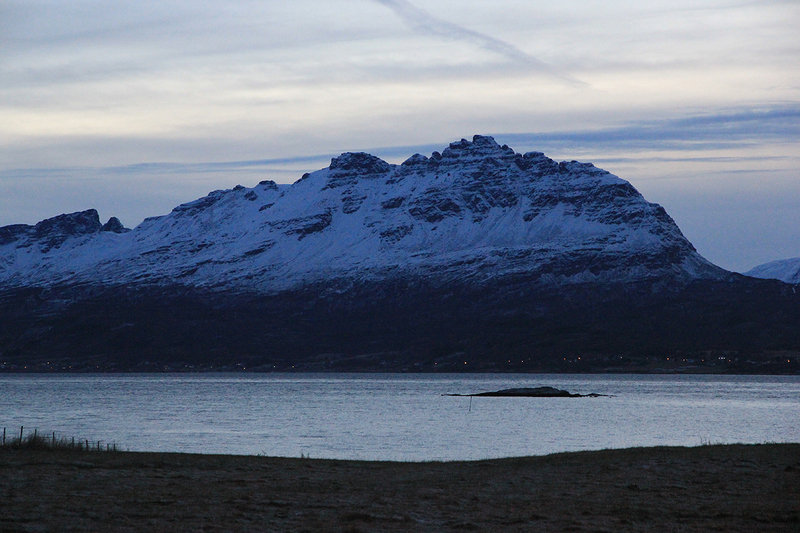 After climbing Nona on Saturday, I headed back to Harstad with the 1500 ferry, then caught the 1615 ferry to Rolla. Arriving there at 1700, I continued to drive across the island, then through the tunnel connecting to Andørja. I parked at the trailhead and slept in the car, observing a sky filled with stars overhead. This looked good for early morning hike. I had breakfast the next morning, preparing to leave as I noticed a morning temperature of -6 degree Celcius. Obviously, it would be considerably colder about 1300 meter higher up. 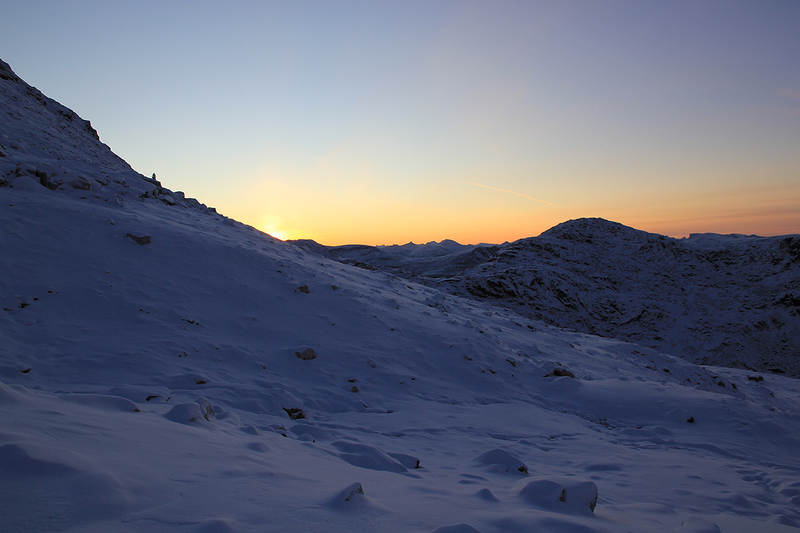 I left at 0645, the trail was not hard to follow in the beam of my strong head lamp. It got light as I arrived at the small lake at about 500 meter of elevation. I turned off the lamp and got momentarily lost as I headed further uphill instead of turning right. Understanding the mistake after a quick check on the map, I continued to the lake at 576 meter. Climbing onto the ridge was slightly tricky as the cliffs looked like a single, big frozen waterfall. As soon as this obstacle was behind me, the hike to the ridge and further along the ridge was very nice indeed. The snow depth increased somewhat and I had to break trail with every step. 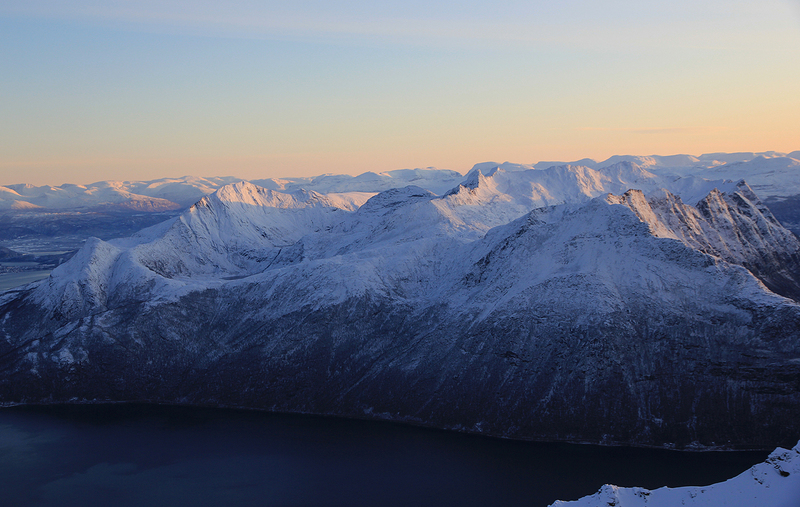 When reaching 1100 meter of elevation, the sun came up on my right hand side, it had already been shining for a while at the Langlitinden summit. 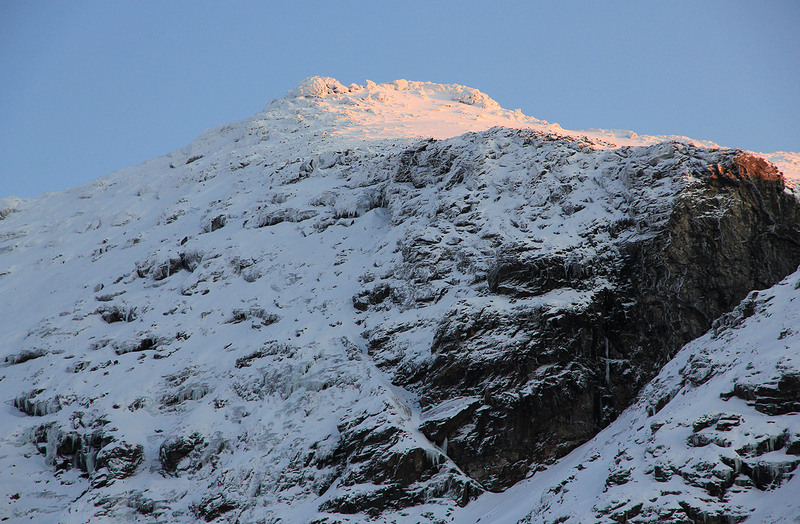 The final slope was icy with some thin layer of new snow on top. 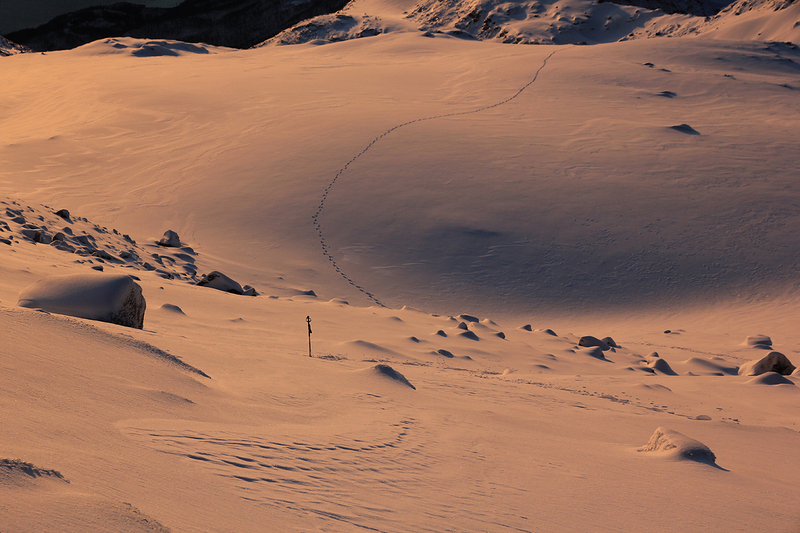 I left my poles behind and put on crampons, they were extremely nice on this type of surface. Climbing the final slope, I first got to the south ridge near the summit. 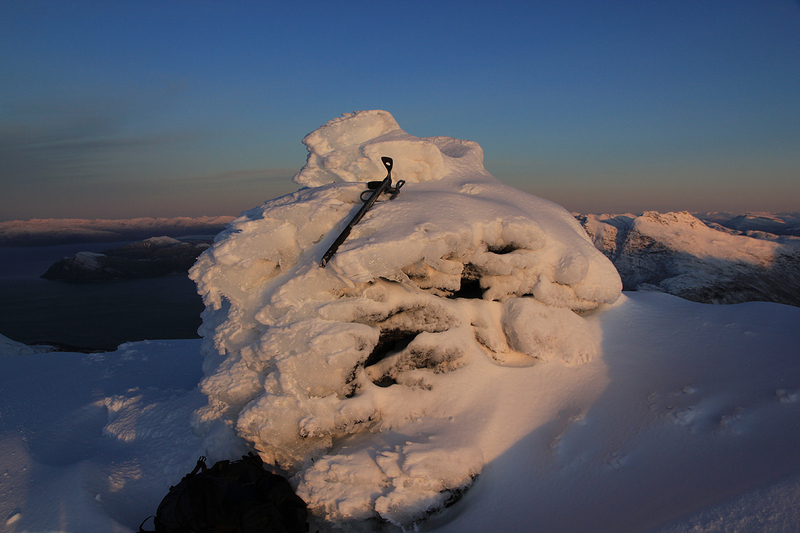 Seeing that there was no easy way from the south, I traversed north on the west side of the summit, reached the small col and walked the few last steps to the cairn. It was a very nice day indeed, the sun was low and red, the time was 1115. I decided to take a full 360 degree panorama. Many summits in all directions, I knew that Jonathan de Ferranti would help me identify their names as soon as I returned home. 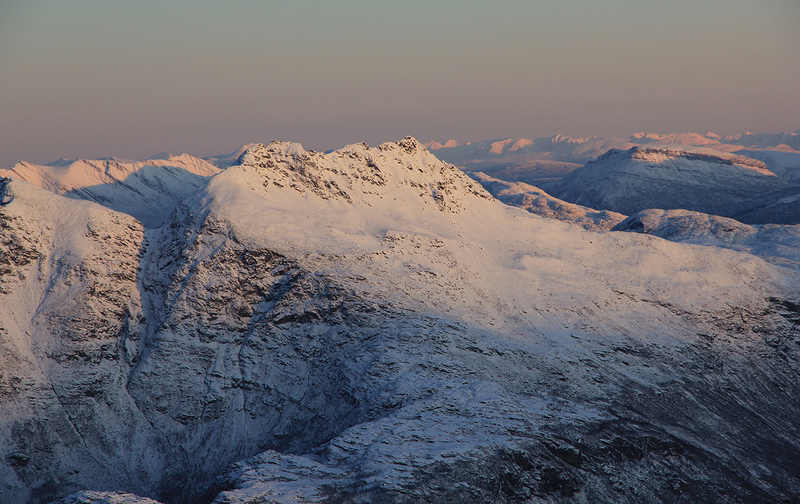 Interesting mountains and very unusual light. 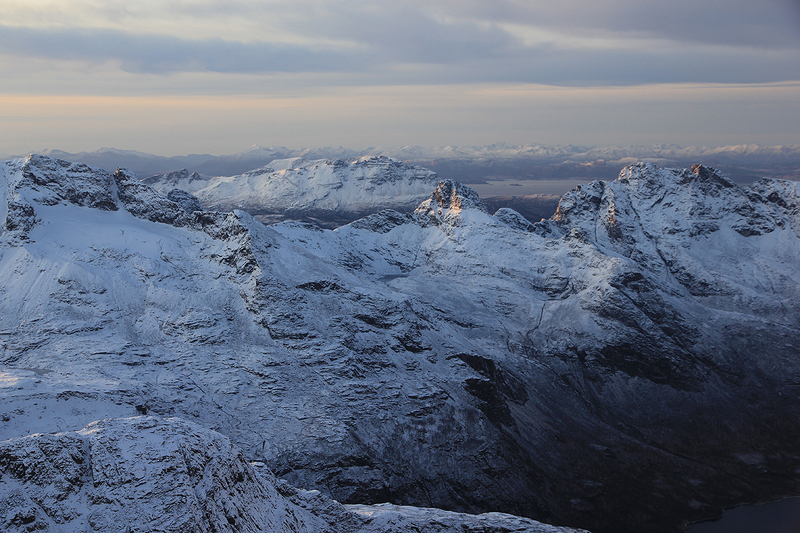 With such a low sun and such a rugged landscape, the shaddows dominate, but the peaks shine like jewlery. 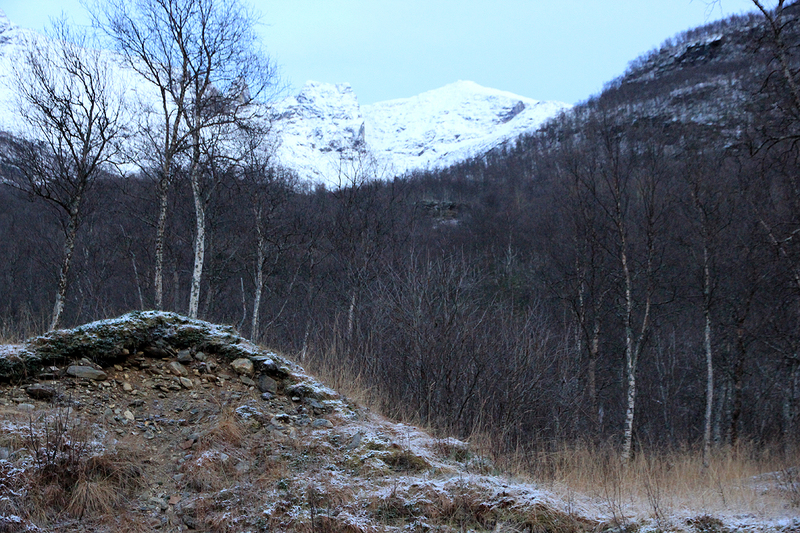 Grytøya was easy to recognize, with its highest point Nona, 1012 meter, where I stood yesterday. I left at 1130 and carefully retraced my steps on the upper, slightly steeper slope. 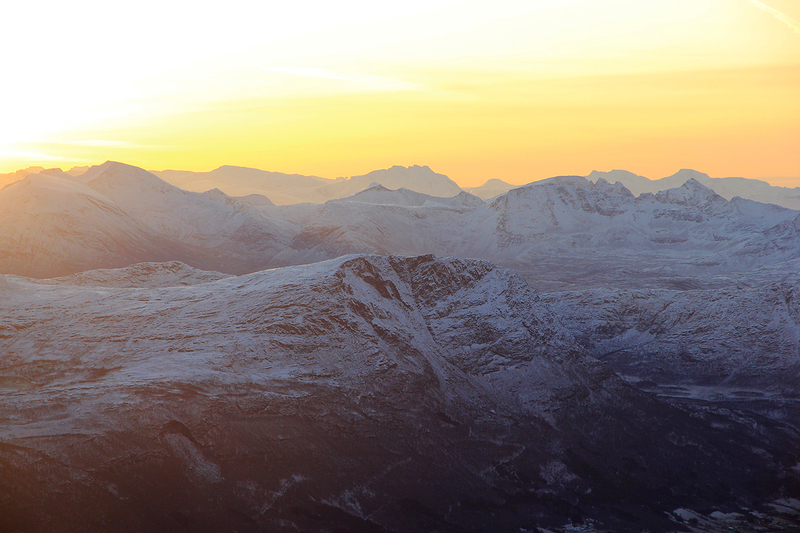 The sun quickly set behind the high peaks. Otherwise, the descent was uneventful. I strolled downhill in my footsteps and enjoyed the remoteness and the silence. I reached the 500 meter lake already at 1300, and another 45 minutes to the car, well ahead of darkness. 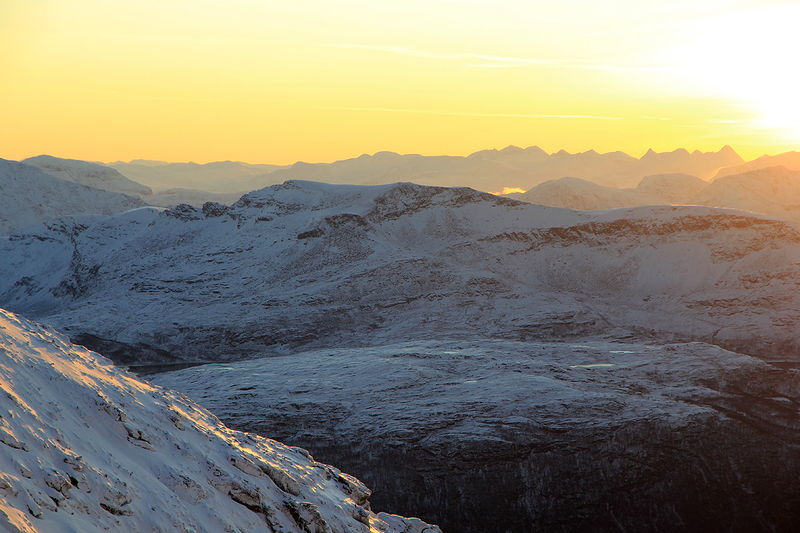 This concluded my weekend of late November mountaineering. 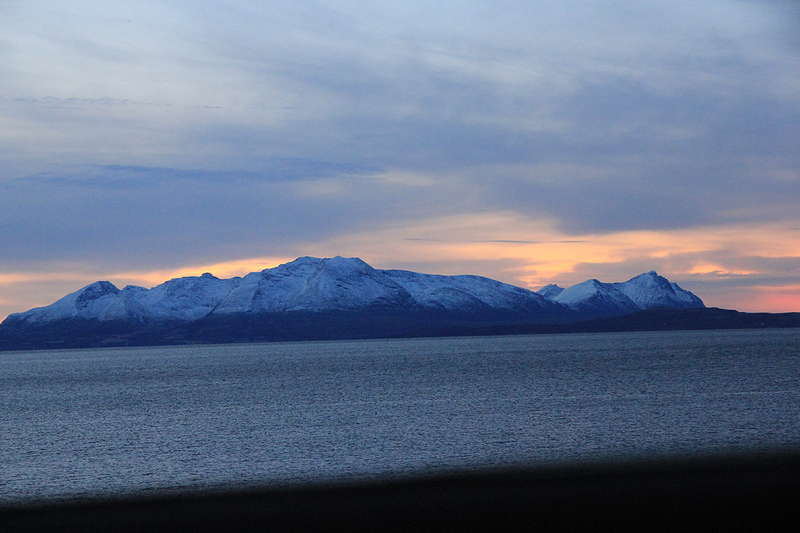 I drove to Tromsø where I had a two day meeting. As I drove along the west side of Andøjra, I had a good look at Drangen, the highpoint of island Rolla, a peak I am looking forward to visit, perhaps next year? The trailhead, the trail starts further left. 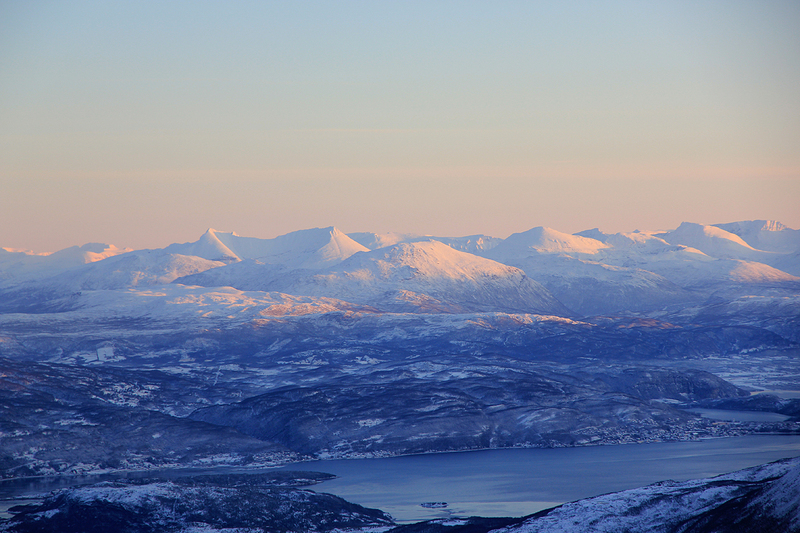 Snøtinden, 1215m, to the southwest. Ristinden, 1055m, to the southwest. Grytøya island, where I climbed Nona the day before. 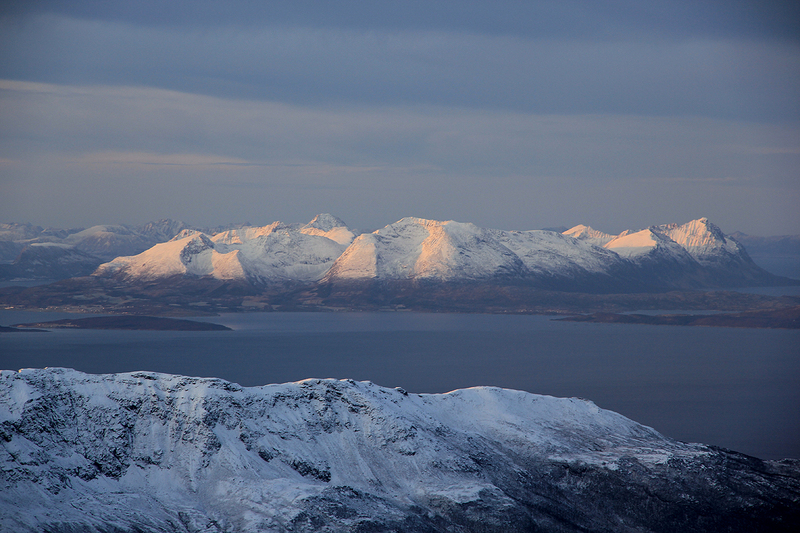 View north, to the southern tip of Senja. 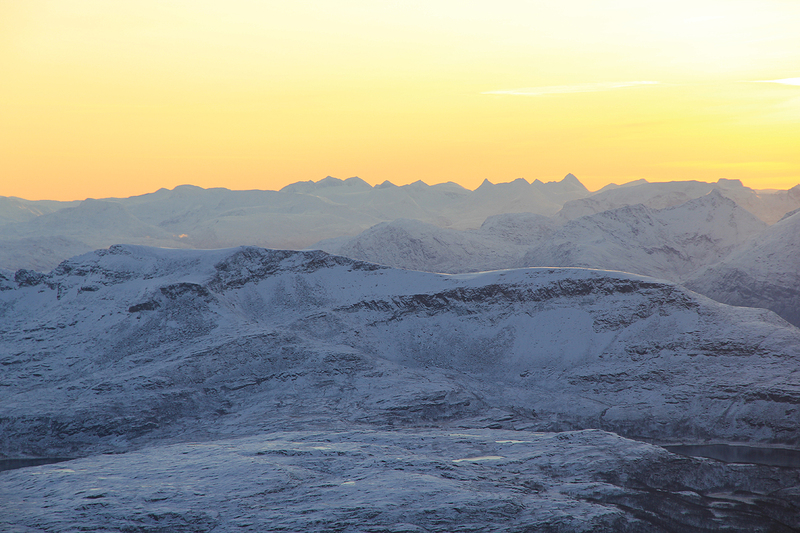 View across Ristinden, the last rays of sunshine. 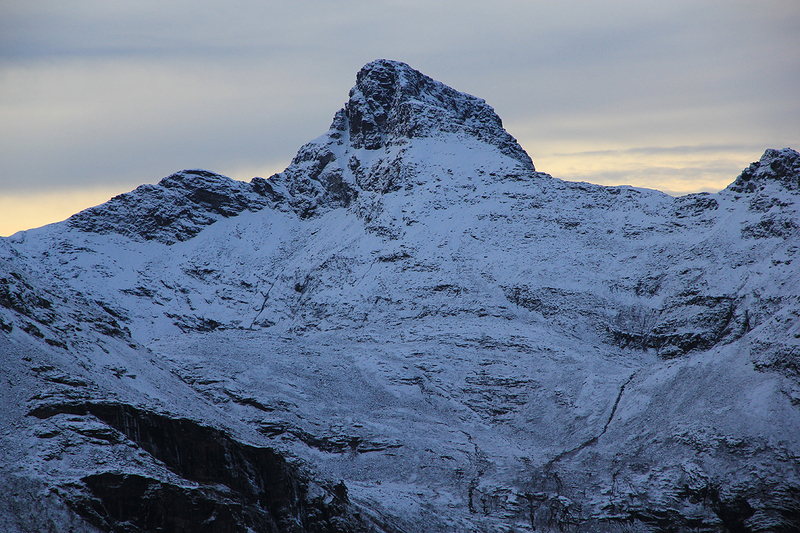 Løksetind, 1242m, to the northeast. The horseshoe ridge with Reitetinden and Elveskardtinden. View, just east of the sun. View, just west of the sun. Grytøya, as seen from Andørjra. Nona can just barely be seen.